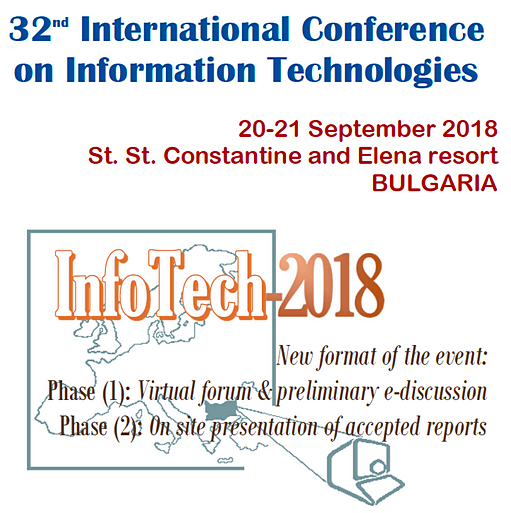 The international conference TELECOM 2018 took place at the National Center of Science and Technology (NCST) – Sofia, 108 Rakovski St., BULGARIA. Electricity 2018 highlights the enabling technologies and regulation which are essential for the ongoing energy revolution, and that were covered in the previous annual meetings. Innovations in the energy market will be emphasized in the plenary sessions; it will reflect in the interactive panels and round tables, and will be mentioned throughout the parallel sessions. Electricity 2018 brings together the entire electricity engineering and HVAC community; young engineers alongside veterans, practicing engineers alongside researchers, policy making officers alongside managers from the industry. It is an opportunity to meet with the market decision makers, to visit the exhibition which presented new products and the latest technologies. Take advantage of this unique networking platform and get familiar with the latest revolutionary trends that are reshaping the global energy arena. The conference ELECTRONICA 2018 (IEEE Conference Record Number 44534) continues the discussion initiated by Electronica 1991 on the state and prospects for the development of the Bulgarian electronics research, education and industry in a globalized world economy and EU membership. Papers discussing theoretical and applied electronics are submitted and presented by leading Bulgarian and foreign specialists. The conference is attended by many of Bulgarian and foreign companies. An exhibition and Round table discussion is organized. The official conference language of the submitted papers is English. 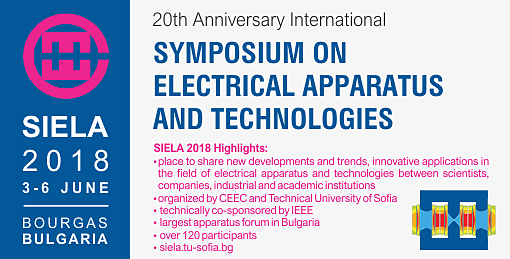 20th International Symposium on Electrical Apparatus and Technologies - SIELA 2018 organized by Union of Electronics, Electrical Engineering and Telecommunications (CEEC) and IEEE Bulgaria Section took place 3-6 June 2018 in Bourgas, BULGARIA. SIELA is registered with the IEEE. The aim of the symposium is to provide exchange of information and experiences on the new developments, trends and applications under industrial and academic view points in the field of electrical apparatus and technologies, as well as to stimulate personal contacts and fruitful cooperation, especially between industrial and academic institutions. 1. Field problems, study, design and optimisation. 10. Informatics, Computer Science and Communications. The 13-th Conference EBT2018 is a triennial (now biennial) meeting that brings together physicists, chemists, materials and electronics engineers from universities, research Institutions and industry who are involved in various studies and applications of electron beam techniques and technologies. The conference is one of a series which started in 1985 in Varna, which has remained the venue for all subsequent meetings. During the period from the First International Conference on EBT there have been great advances in the field of electron beam technologies. The success of the twelve events of this series clearly demonstrated that the scientist and engineers, working in the academia and research and development laboratories of industry continue to make contributions to technology development of community life, based on knowledge. The content of this Proceeding shows a great scope of activities and a big potential of developed technologies to increase efficiency of industrial fabrication, to create new products and to improve the life standards. Electron beam technologies celebrate now 50 years from the first machines and industrial technologies based of application of intense electron beams in vacuum. In the Proceedings of Conferences on EBT in Varna, organized during the last 30 years, the history of ides, the basic objectives in our field and the personal success of two-three generations researchers could be traced as an example of the flexibility of the subject of Interest of participation organizations, the progress in the development and optimization of electron beam applications in nanotechnology and biotechnology. Investigations and implementation of selective melting for 3D print structures and a group of sophisticated modern surface treatment methods could be pointed out, together with the remarkable conventional topics as beam physics and generation, electron beam welding, electron beam melting and refining, electron beam evaporation and deposition of functional coatings, electron accelerator applications for modification of various materials, thermal treatment and processing of polymers and composites with electron beam, electron and Ion lithography. Ion implantation; laser technologies; modeling physical processes by Interacting Intensive electron and ion beams with materials. This and all twelve previous conferences of this series have provided an excellent forum for exchange of results and experience in the development of EB technologies and were a place for forging human links and for developing learning and understanding between participants. They are also a place to search tor partners for cooperative programs of work and to make business contacts. • electron beam equipment design and automation. CEEC partners with the 26th International Trade Fair of Electrotechnics, Electronics, Automation, Communication, Lighting, and Security Technologies, AMPER 2018. AMPER is known as a prestigious fair with a tradition by high number of satisfied visitors and participation of world-famous companies. It is the most important trade fair of the electrical field in the Czech Republic in nowadays. Its commercial importance extends across Central and Eastern Europe. Let´s have a look at the previous edition of AMPER Trade Fair. 600 exhibitors, including 151 from abroad introduced their technologies and services on the 14.500 square meters of net exhibition space. 43 800 professional visitors who were represented by company managers, technicians, students and fans of the electrical engineering. The trade fair was held under the auspices of the Ministry of Industry and Trade, the Chamber of Commerce, Čeps, the Mayor of the City of Brno, the Chamber of Deputies of the Parliament of the Czech Republic, Prime Minister of the Czech Republic, and the Governor of the South Moriavia Region. It was supported by professional media, associations and universities. AMPER Trade Fair brings to its exhibitors an ideal space for establishing new business relationships, strengthening the competitive position on the market, maintaining relationships with existing customers and enhances image of the brand. And finally the trade fair also offers effective presentation and promotion of new products (promotion not only on the trade fair itself, but also through professional media partners of the fair - articles in specialized portals and specialized printed media and on amper.cz website). The effect of the fair itself extends beyond the gates of the exhibition centre and date of the event.